Our challenge this week was to create a project that reflected the year we graduated from high school. While the other gals went totally retro with the cool 70's vibe, I went totally abstract. 1992 was the year of the monkey, so this is why I did a monkey card (care to see some other fun facts about 1992? see below picture). 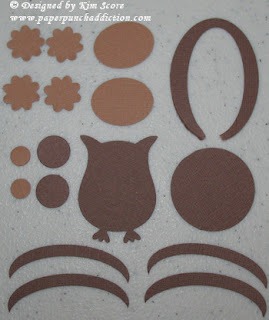 Be sure to hop on over to the PKS Challenge blog to see the other groovy projects. If you have some PKS face stamps, you can play along for a chance to win a $20 gift certificate! Top musicians include Natalie Cole, Bonnie Raitt, Van Halen, Metallica, DJ Jazzy Jeff and the Fresh Prince (aka Will Smith), Boyz II Men, Luther Vandross, Michael Bolton, R.E.M. Trim feet and round out top of head on owl. Clip away 1/4 of the ring to form tail. Trim petals off boho blossoms to form hands. Sponge edges of all pieces with chocolate chip ink. Attach belly to body with dimensional. Glue hands and feet onto arms and legs. Glue small circles together for ears and attach to back of head. Stamp face on medium oval using the Peachy Keen PK-140 Teddy Bear and Reindeer Face Parts stamp set and Black Staz On ink. Add blush to cheeks with regal rose ink and highlights to eyes and nose with white unibal gel pen. Attach face to head with dimensional. Attach head to body with dimensional. Glue arms, legs, tail and heart onto body. Hand cut a tree limb out of wood grain print paper. Punch small leaves from Blossom Petals in certainly celery and pear pizzazz and glue onto limb. Hook monkey tail onto limb. Die cut grass and clouds using dies from My Favorite Things. Stamp greeting from My Pink Stamper. 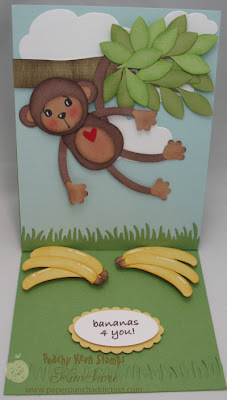 Create bananas by punching 6 curved sections of so saffron cardstock with Large oval punch. Punch 6 jewelry tags. Clip off the tops and sponge with chocolate chip. Sponge edges of bananas with more mustard ink. Glue rounded part of tag to top of banana. Bunch bananas and attach to card with dimensionals. Base of card is 4 1/4 x 11 Wild Wasabi cardstock. Fold in half and then fold one of the halves in half to form base of an easel card. Cut 4 1/4" x 5 1/2" Soft Sky card stock for card front. I wish I grad from highschool in '92... oh well! Great card and wonderful punch art. I love the bananas and would not have guess it was the large oval! tks for sharing. What a cute monkey!! Love that list of 1992 events. Brought back memories like it was only yesterday! Wish the gas price WAS only yesterday!! I already told you on the PKS site, but your card is so cute! You make the most amazing punch art! I graduated from college in 1992 and reading everyone's lists, it's amazing how fast time flies and much we forget. This was a fun challenge. I've got to admit I was puzzled at first by your card. How clever of you, now it makes perfect sense! Great card and great post! Very cute Kim. Thanks for the tutorial. I will be making him for sure. Your punch art is amazing.